The Harvest of the Month (HOTM) featured item for March is hydroponic Bibb lettuce. Check out these resources and ideas to celebrate Harvest of the Month with local hydro Bibb lettuce! Serve a salad with Bibb lettuce or mix Bibb lettuce with other lettuce varieties. Serve Bibb lettuce on the salad bar. Add fresh Bibb lettuce to sandwiches, burgers, tacos or wraps. What’s Cooking? USDA Mixing Bowl – search for large quantity salad recipes. Taste test hydroponic Bibb lettuce, with or without a low-fat dressing for dipping. 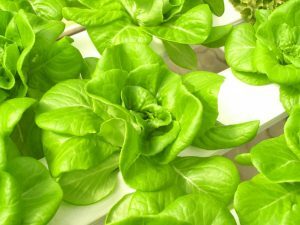 Include education about the nutrients found in lettuce and about hydroponic growing. Taste test hydroponic Bibb lettuce and other lettuce varieties. Have students compare the different types of lettuce and vote on which the prefer. Provide education on the different types of lettuce varieties and growing methods. Q: What did the lettuce say to the dressing? A: Lettuce be friends! Q: What did the lettuce say to the celery? A: Quit stalking me! Lettuce Try It! 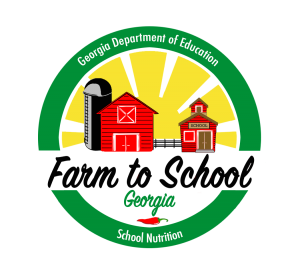 – the 2013 October Farm to School Month campaign from Georgia Organics. Resources include lesson plans, how to conduct a lettuce taste test, how to grow lettuce in a school garden, and salad dressing recipes. Lettuce – find resources for lettuce, from the USDA Healthy Meals Resource System. What’s Cooking? USDA Mixing Bowl – Search for recipes using lettuce in this interactive website. The website includes a searchable database for healthy recipes and can help with meal planning, cooking and grocery shopping, from the United States Department of Agriculture, Food, Nutrition and Consumer Services. MyPlate 10 Tips: Add More Vegetables to Your Day– A one page tip sheet on adding more vegetables to your meals and snacks, from USDA, Center for Nutrition Policy and Promotion.